Discussion in 'Current Events' started by Paul7, Feb 4, 2019. Does anybody seriously believe Obama gets the credit for this? headhawg7, Josephwalker, jay runner and 1 other person like this. 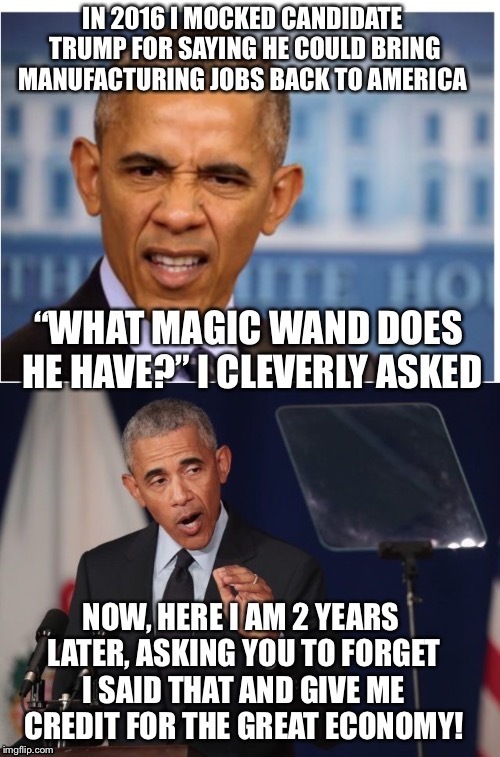 Trump must of found that magic wand Obama was talking about. 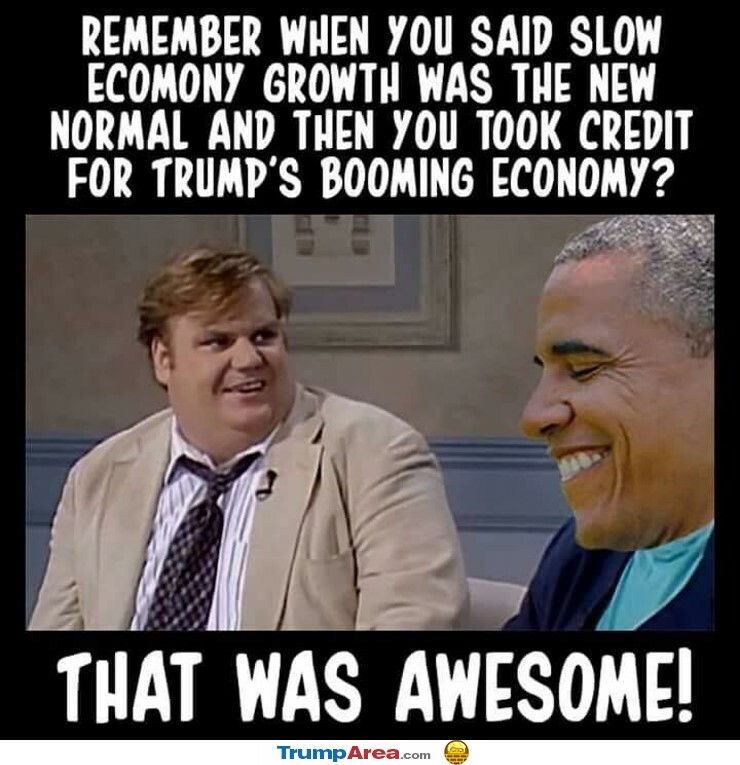 If Obama knew the economy was going to be awesome, he would have said the economy would be great because of him regardless who won. Instead we got the new normal / managed decline talk. headhawg7, Josephwalker, jay runner and 4 others like this. Keep up the good work. Maybe he can catch him. The whole right wing now thinks like Trump. MissingMayor, dairyair, rahl and 1 other person like this. Trump gave Big Biz a big tax break. Nothing wrong with that... until he did that, we were tied with Japan for having the highest taxes on corporations in the world. But who should get the 'praise' (assuming that's still the word we want to use in the coming years)? The Federal Reserve System. Yes -- our all-powerful central bank picked 'winners-and-losers', rescued those it considered to be "too big to fail", and today's economy -- good and bad -- is the work of the "Fed"... and not much else. But, Trump can take credit for the tax cut. It didn't do ME or anyone I know any measurable good, but, what the hell.... It didn't hurt us, either. headhawg7, Jestsayin and Zorro like this. That's a nice thing about righties. They are so easily confused. 9royhobbs and Cubed like this. How about a graph that identifies more specifically with the impact on Manufacturing Jobs attributed to the Trump Administration? Josephwalker, Robert and Zorro like this. Call when he gets back on Obama's curve. Isn't ANYBODY going to give PRAISE where 'praise' is due? We may curse the Fed someday for manipulating and mutilating what was once a free-market economy roughly twelve years ago, but for the moment, shouldn't the FED get the 'credit' for the economy...? It wasn't Obama, and, in fairness, it isn't really Trump, either.... A tax break for big companies. Hooray. It was long overdue... but was THAT supposed to be some kind of national "salvation"...?! Given the strength and trajectory, you may have a long wait before you get that call. It would be a lot more impressive if Trump didn't have to borrow $2 trillion dollars in "Fake" money to stimulate the economy. In that way, both Obama and Trump are EXACTLY the same. It's been the norm since Reagan increased the debt 170% to stimulate the economy. Hell, even Carter had a better GDP number than Trump. He's not that impressive. I think you are confusing Obama with Bush. This is great to see because Manufacturing is middle America. For far too long we have been drifting away from these type of jobs that establish a middle class. Fred C Dobbs, headhawg7, myview and 3 others like this. For manufacturing jobs to come to America in an significant numbers we need to invent something that can't be built by machine or cheap labor. REALLY? ?What exactly is being manufactured in this supposed huge surge in manufacturing? ?Not TV's,Computers,Cell Phones,Autos,Clothing,Furniture,please explain where we are seeing this resurgence of manufacturing?? I guess now that a Republcian is in the White House, deficits don't matter again! Not possible. Why would I want to see the lackluster results from the Obama Administration continued? I want people to get jobs, and having been a manufacturing business owner for almost 40 years, I want jobs in that category to improve, not dissolve, as Obama's policies pushed for. Obama was an affirmative action POTUS. Trump is the real deal.